He's won some of the most competitive cycling races around the world, including the Tour of Germany and the Tour of California, and was the team leader of The Discovery Team in this year's Tour de France. But Levi Leipheimer still manages to find time to help animals caught up in a race for their lives: the U.S. dog and cat overpopulation crisis. The top-ranked cyclist stars along with his rescued dog, Bandit, in PETA's first-ever Animal Birth Control (ABC) ad to persuade people to stop bringing more litters into the world by sterilizing their dogs and cats (preferably before the age of 4 months, so there are no "oops" litters). In the ad, Leipheimer urges animal guardians to spay and neuter their animal companions, saying, "U.S. animal shelters must put to death nearly 4 million dogs and cats every year." Leipheimer adds, "You can help stop the cycle of unwanted animals. It's as easy as Animal Birth Control! Save lives: Always spay or neuter your animals, and never buy them from a breeder or a pet store." Leipheimer - along with his wife, Odessa Gunn - runs Freedom Hill, a foundation that helps abandoned animals. 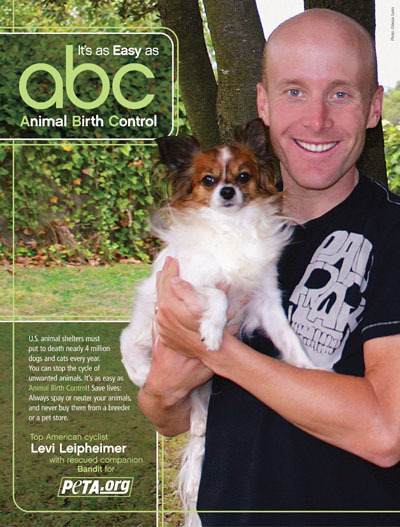 In an exclusive interview with PETA, which can be read in its entirety at PETA.org, Leipheimer talks about finding time for animal rescue, how vegetarian food gives him the energy he needs to stay in top shape, and the importance of spaying and neutering companion animals. Says Leipheimer: "In the United States, there really isn't any excuse for not spaying and neutering your pets. There are low-cost spay-neuter options in almost every city and town. All you have to do is look." Levi Leipheimer's ad can be viewed at www.PETA.org.